I've written about Judith S. Kaye a lot on this blog. 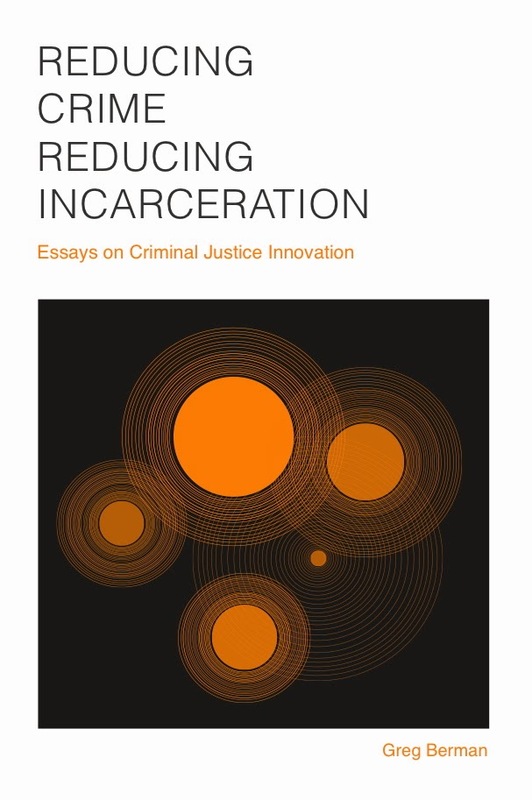 There's a good reason for that: the Center for Court Innovation would not exist but for her support and advocacy. 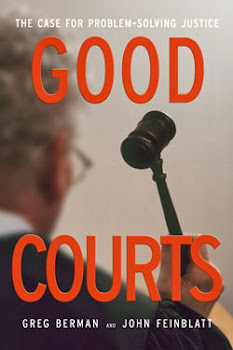 Back in 1996, it was not exactly a slam dunk that a new organization devoted to promoting justice reform, with a special focus on working with the New York court system, would succeed. Judge Kaye's endorsement -- and her willingness to invest in us -- was really what made the idea work. I'm not 100 percent certain why Judge Kaye chose to make this leap. Certainly one of the reasons was her faith in John Feinblatt, our founding director. But, in general, the willingness to take (calculated) risks was one of Judge Kaye's hallmarks. In a conservative profession (with a small "c"), she stood out for her intellectual curiosity, her sometimes subversive humor, and, most of all, her sustained appetite for reform. In the process, Kaye left a mark not just on New York, but on the world. She was willing to use her bully pulpit to advance a broad array of causes -- reforming the jury process, rethinking the approach to domestic violence cases, and forging a new response to addiction, to name just a few. Many states around the country answered her call and adapted her ideas. Along the way, she helped define the field of problem-solving justice -- if I am not mistaken, her editorial in Newsweek ("Making the Case for Hands-On Courts") was the first mainstream use of the expression. I am just scratching the surface of Kaye's accomplishments because I know that the Internet will fill in the rest for anyone who is interested. But I cannot close without acknowledging my huge personal debt to her. When John Feinblatt left the Center back in 2001, Judge Kaye was willing to take another big chance, this time on me. In blessing my appointment as director, she was placing her bet on a young and untested leader at a vulnerable moment in the agency's history. Having made this decision, she was unfailing in her support of me over the years -- offering advice, making useful connections, and championing the Center whenever she got a chance. My last two interactions with Kaye were typical: she sent me an email congratulating me on a recent article about the Brownsville Youth Court (youth courts were a particular area of interest for her) and she made a generous personal donation to support our work. Judge Judith Kaye was a trailblazer as Chief Judge, who never stopped blazing trails even after she left the court. She pushed New York forward on specialized courts for drug addiction, mental health and domestic violence, and instituted historic reforms making jury service fairer and more efficient. 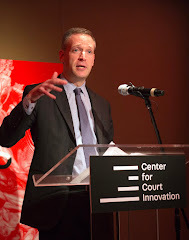 The Center for Court Innovation, established on her watch, is the envy of judicial systems across the country and at the vanguard of today’s effort to reform our country’s justice system. In her retirement, Judge Kaye was a fierce advocate for ending the school-to-prison pipeline and continued to impact our judiciary as Chair of the Commission on Judicial Nomination. Her passing is a tremendous loss for our state. As an administrator as well as a judge — “each of these jobs took 80 percent of my time,” she said — she was instrumental in the creation of courts devoted to specific problems, like drug abuse, as well as locally focused courts, including the Midtown Community Court in Times Square, which has dealt with panhandling, prostitution and other neighborhood issues. 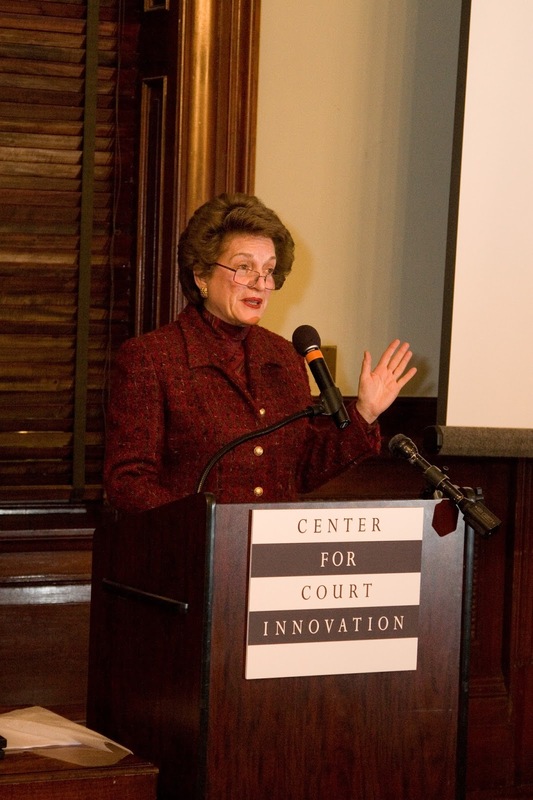 Judith Kaye was not only the longest serving Chief Judge in New York State history, and not only the first woman to hold the post; she was also one of the most respected judicial innovators of our time. Her early and strong support for problem-solving courts, such as the Midtown Community Court that helped clean up Times Square, played an important role in making New York a national leader in reducing crime and recidivism. I was lucky to call her a friend, and the city and state will benefit from her leadership for decades to come. We pay tribute to Judge Kaye’s clear-eyed and elegant judicial opinions in which she cut back on the death penalty, supported gender equality and promoted juvenile justice. We applaud her leadership in creating a national movement supporting problem-solving courts. In fact, the Center for Court Innovation, which she launched as a vehicle for these courts, in now a significant employer of John Jay alumni and students who are attracted to this vision of justice.